The collaborative laboratory of Dr. Louise Mawn of the VEI and Dr. Robert Galloway of Biomedical Engineering focuses on improving orbital surgery using minimally invasive techniques and image guidance. The surgical and medical treatment of disease of the orbit is challenging in part because of the difficulty reaching the space behind the eye. The orbit houses the optic nerve; disease of the optic nerve is the leading cause of irreversible blindness worldwide. The laboratory uses anatomical studies, imaging technology and biomedical engineering to improve approaches to the optic nerve and retrobulbar space. Orbital Endoscopy. Work in our laboratory demonstrates that the optic nerve can be safely apporached using an orbital endoscope. 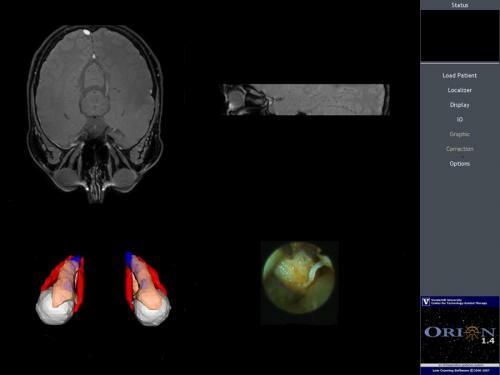 In previous projects, we solved the problem of endoscopic approach to the orbit and orbital visualization. We developed this method in both pig and human cadavers and then successfully performed optic nerve sheath fenestration using a laser through the endoscope in 10 live pigs and demonstrated histologic confirmation. Navigation within the orbit was difficult as traditional landmarks were lost as the endoscope moved through the orbit with fat on all sides of the endoscope path. We plan to solve the problem of navigation with intraoperative image guidance. Image Guidance. Like global positioning systems for vehicle navigation, image-guided surgery (IGS) provides the surgeon with real time spatial information. Image-guided procedures involve the use of medical images to select, plan and guide an intervention. Advances in image-guided, minimally-invasive surgery have achieved clinical impact and become the standard of care in neurosurgery, endoscopic sinus surgery and some orthopedic procedures. The information realized from tracking the position of an operative instrument or endoscope onto pre-operative images has been shown to reduce operative time, costs, and complications and improve efficacy of surgery. Surgeon intra-operative confidence has also been shown to increase with this added visual data set. The rigid line of sight required by the available systems, preclude the application of image guidance in anatomical locations which are remote or not amenable to rigid instrumentation. Recently alternative technology for non rigid line of sight application has been developed. We are developing an image guidance system for orbital endoscopy using a non line of sight electromagnetic tracker. Atuegwu NC, Mawn L, Galloway R. Transorbital endoscopic image guidance. Conf Proc IEEE Eng Med Biol Soc. 2007; 4663-6, 2007. Sztipanovits D, Galloway RL, Mawn LA. Accuracy assessment and implementation of an electromagnetically tracked endoscopic orbital navigation system. In: Galloway RL, Cleary KR, editors. SPIE Proceedings of Medical Imaging 2005; Proc. SPIE Vol 5744, p.648-660 April 2005. Mawn LA, Shen JH, Jordan DR, Joos KM. Development of an orbital endoscope for use with the free electron laser. Ophthalmic Plastic and Reconstructive Surgery 20(2):150-7, 2004.